Schemmer’s Weeping Water Public Schools Renovation/Addition project was recently featured on KETV Channel 7 News. 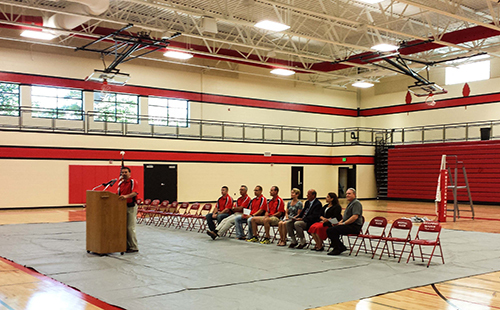 Weeping Water Public Schools revealed their new renovations/addition, the Weeping Water Public Education Campus and Wellness Center, on September 13, 2015 and Schemmer personnel Terry M. Wood, AIA, Project Manager and Architect, Molly Macklin, Assoc. AIA, Architectural Designer and Mike Fortenbury, Construction Contract Administrator, were on hand for the event. The improvements were made possible by a $12 million bond approved by the community, which was the first major bond of its kind in nearly 50 years. The need for renovations was reinforced at a wrestling tournament two years ago when a basketball hoop swung from the ceiling injuring four people. A few months later, the bond went up for a vote. "You never want something like that to happen, but the timing of that was interesting in that it did emphasize our aging facilities," Superintendent Ken Heinz said. Schemmer facilitated numerous meetings with administration staff, teachers, board members and the community to help identify the District’s needs, develop priorities and establish budgets for the bond. Through these public meetings and open exchange of ideas, the bond referendum plans were produced. Schemmer provided bond referendum promotional plans, power point presentation with building walk through and graphics for campaign flyers. The Weeping Water Public Education Campus and Wellness Center project added 68,000 SF, which brought all of the students under one roof. It also included renovation of the existing building to incorporate new energy efficient HVAC for heating and cooling and a new fire sprinkler system. An eight-classroom addition to the northwest corner of the existing elementary school houses Pre-K, Kindergarten and additional classrooms. A new handicapped entrance provides access to a fenced playground for the younger students. The east addition (Wellness Center) includes a new competition gymnasium, and Modern Science and Family Consumer Sciences classrooms. The gymnasium has premier basketball courts, plus an upper tier walking and jogging track. It also includes new large and modern handicapped accessible athletic locker rooms; a refreshed wrestling room at court level, which also doubles as the entire school’s storm shelter. A new weight room and fitness center are also open to the community. The Wellness Center is designed to promote wellness at every age and fitness level within the Weeping Water Community. The south addition includes the Media and Digital Learning Center, administrative offices and new secured main entrance. School security, traffic flow for student drop-off points and parking were also improved. The design anticipates the need for future expansion, if necessary. To view the KETV Channel 7 News segment click here.